The Global Volcanism Program has no activity reports for Huambo. The Global Volcanism Program has no Weekly Reports available for Huambo. The Global Volcanism Program has no Bulletin Reports available for Huambo. The monogenetic Huambo volcanic field lies SSE of the Andahua-Orcocampo volcanic field, west of Sabancaya volcano. The field is divided into two segments. The southern area contains several cinder cones and associated lava flows, some of which are inferred to be of early to late-Holocene age on the basis of morphological criteria. The northern part contains a single vent, the Cerro Keyocc cinder cone, which produced an extensive lava field that blanketed a plateau to the west during an eruption radiocarbon dated at about 2650 years ago. There is no Deformation History data available for Huambo. There is no Emissions History data available for Huambo. 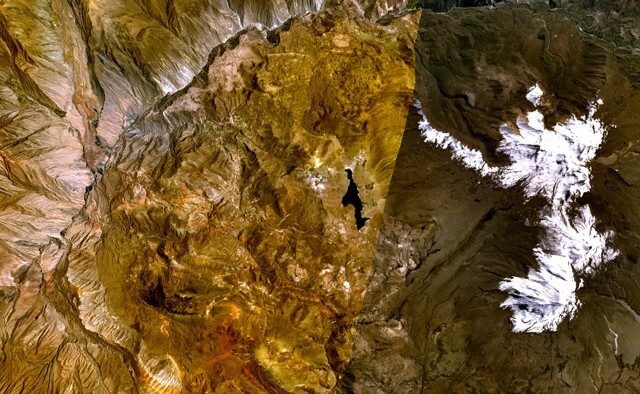 The dark-brown area just north of the elongated black lake at the center of this NASA Landsat image is a lava flow from the northern segment of the Huambo volcanic field. The flows were erupted from the Cerro Keyocc cinder cone about 2650 years ago. The southern part of the volcanic field, the dark-brown area at the SW part of this image, contains several cinder cones and associated lava flows, some of which are inferred to be of early to late-Holocene age. The large glacier-covered massif to the east is the Sabancaya volcanic complex. There are no samples for Huambo in the Smithsonian's NMNH Department of Mineral Sciences Rock and Ore collection. Large Eruptions of Huambo Information about large Quaternary eruptions (VEI >= 4) is cataloged in the Large Magnitude Explosive Volcanic Eruptions (LaMEVE) database of the Volcano Global Risk Identification and Analysis Project (VOGRIPA).